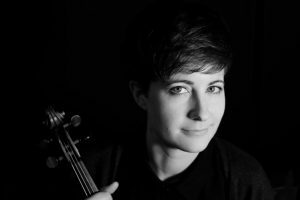 Originally from Vancouver, BC, violinist, Erin James holds a Master of Performance Degree from the Royal College of Music in London and a Bachelor of Music Degree from the University of British Columbia. Many of her performances have been aired on CBC Radio and have taken her to Canada’s most important concert halls and across Asia, Europe and North America. As well as performing internationally, Erin has undertaken additional training in Sweden, France, Italy, England, the US and Canada. Erin’s esteemed professors include Robert Uchida, Yossi Zivoni, Jasper Wood, and Andrew Dawes to name only a few of the musicians who have inspired and challenged her artistry. Previously based in Vancouver, Erin was an avid chamber musician, violinist with the Vancouver Symphony Orchestra and maintained studios of violin students at the Vancouver Academy of Music and the Saint James Music Academy. Erin is currently based in Edmonton where she performs with the Edmonton Symphony, the Chamber Orchestra of Edmonton, the Alberta Symphony Orchestra, Early Music Alberta and the Alberta Baroque Ensemble. Erin has begun her Doctorate in Violin Performance at the University of Alberta and is a recent recipient of Queen Elizabeth II and Doctoral Recruitment Scholarships.